ENGLAND . . Somerset . . .Up a long steep hill into a wet wind with legs of spaghetti, I'm sopping wet inside my raingear. Exhausted, I flop under a tree to sleep in the rain, and begin again, wearing only shorts and tee shirt. I'm wet, but comfy. Atop the next steep hill, I find a pub with shower, beer, food and a room. I sketch patrons in trade for beer and food. 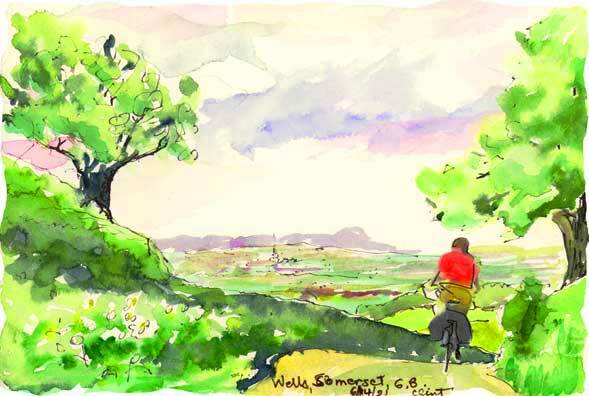 Here is a watercolor of me on a hill leading down in the town of Wells.